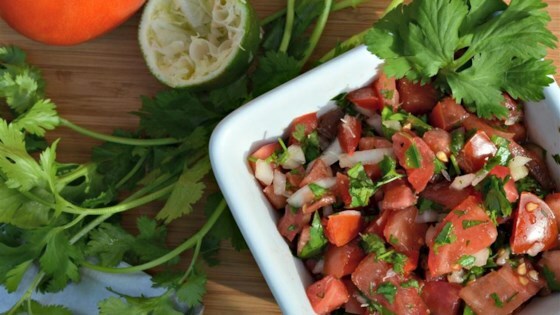 "Sweet and spicy pico de gallo-style salsa with my secret ingredient!" Mix parsley, cilantro, lime juice, salt, garlic powder, chili powder, black pepper, and tequila together in a bowl. Add tomatoes, onion, and green bell peppers and toss to coat. Refrigerate. Use your food processor to make homemade salsa from fresh ingredients. Excellent! I made a small batch of this for another recipe. No tequila on hand, but this was still pretty good. Initially this was lacking punch and heat. We added a jalapeno and a 2nd onion which picked it up a little.